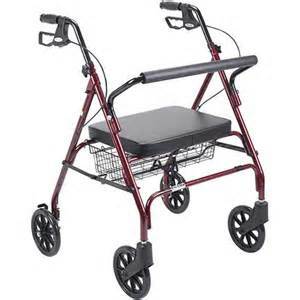 Durable 4-wheel rollator with fold-up removable back, 8" casters and loop locks, red. Removable, hinged, padded backrest can be folded up and down. Comes with a basket to store personal items. Durable frame. Ergonomic handles are easy to grip and are adjustable in height.